Niko Bellic talking to Vladimir Glebov inside Comrades Bar. Lose Ivan in the car chase. Ivan the Not So Terrible is a mission in Grand Theft Auto IV given to protagonist Niko Bellic by Vladimir Glebov from Comrades Bar in Hove Beach, Broker, Liberty City..
Niko Bellic enters Comrades Bar, where Vladimir Glebov waits for him. He tells Niko that there is a man he wants dead, Ivan Bytchkov, and has set him up by telling him to rob Roman Bellic from his cab depot, where Niko has to go and kill him. As Niko leaves Comrades, he drives a car over to the cab depot. As he reaches the building, Ivan flees in his Ruiner. Niko must chase Ivan around the Hove Beach area. After a short chase, Ivan reaches a dead end at a construction site. He climbs up a ladder and onto the scaffold. The player must now climb up some ladders while pursuing Ivan. Ivan runs up a stair case and climbs onto a crane. As Niko climbs up a crane ladder, Ivan runs along the crane and jumps onto a roof. Niko continues following. Jumping from rooftop to rooftop. Ivan reaches one last roof and runs across a catwalk in a rush. Ivan goes to run down the fire escape but it is broken. He takes one step too far and falls. He clings on to the ledge, dangling helplessly. Ivan tries to reason with Niko as much as he can, pleading him to help him up. The player must now choose to kill or spare Ivan. If the player chooses to kill Ivan, Niko reminds Ivan that he made a promise to Vlad to deal with him and stomps on Ivan's fingers, sending him crashing to his death on the footpath below. If the player chooses to spare Ivan, Niko will pull him to safety. Niko then tells Ivan to get out of Hove Beach. Ivan promises to leave and then thanks Niko, calling him a "good man". He then runs away. No matter what choice you make, Niko will call Vlad and tell him that he dealt with Ivan and that he will not see him anymore. The player gets $200. In addition, if the player decides to spare Ivan's life, he will become a random character later in the game. The whole traffic during the chase is scripted (as numerous other missions in the game) so the vehicles seen in the traffic are not random. A speeding Futo, a Chavos and a Marbelle in Mohawk Ave.
A Marbelle (and a parked Perennial) in Onion St.
A Stratum in Asparagus Ave.
A Perennial and a Voodoo driving (and one Perennial and three Marbelles parked) in Munsee Ave.
A Marbelle and a Yankee in Montauk Ave.
A Chavos (and two Perennials and a Futo parked) in Hickcock St.
A Marbelle and a Perennial (and another parked Perennial) in northern Onondaga Ave.
A parked Stratum in Ringo St.
A driving Bobcat, a parked Perennial, and a stopped Benson and Flatbed (the vehicles Ivan crashes into) in southern Onondaga Ave. There's also a stopped Biff in Kid St. The name of this mission is a reference to Ivan the Terrible, the Russian Tsar between December 3, 1533 to March 28, 1584. During the end credits for The Lost and Damned, one of the scenes shown is the rooftop chase in this mission. Also during the scene, the mission Bleed Out is somehow happening at the same time (Roman's Taxi and Dardan Petrela's car parked on the sidewalk, Bledar Morina and Kalem Vulaj beating up Roman in the basketball courts under the El Train) despite already being completed. It is possible to kill Ivan before he reaches the ledge, if you shoot him enough while he is running away, he will become wounded. The player can then finish him off. At the beginning of the mission, Jimmy's car, a Blista Compact, that you stole in the previous mission is parked in front of Comrades Bar. This mission is similar to the Grand Theft Auto: Vice City mission The Chase. There are some rumors that state the rooftop chase was based on a scene from the film, In The Line Of Fire; where Clint Eastwood chases John Malkovich across rooftops in Washington D.C.. Eastwood ends up being saved from the person he was trying to catch (instead of Niko saving/killing Ivan in the mission). If the player approaches Roman's garage from the north, Ivan will take a much shorter journey to the construction site, thus making the mission easier. It is possible to obtain Ivan's uniquely colored Ruiner (black with yellow trim) by entering it as Ivan begins climbing up the construction site. Simply drive it down the block to the south and park it. Ivan will not continue climbing until Niko has begun climbing and you will not fail the mission for moving away from him. After completing the mission, you can just go back down to the street you left the car and park it at any safehouse. 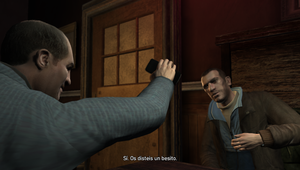 Niko Bellic, left, confronting Ivan Bytchkov. Niko Bellic making his choice regarding Ivan's life. Niko Bellic stomping on Ivan's hands. The corpse of Ivan Bytchkov on the street. This page was last modified on 1 December 2013, at 21:04.